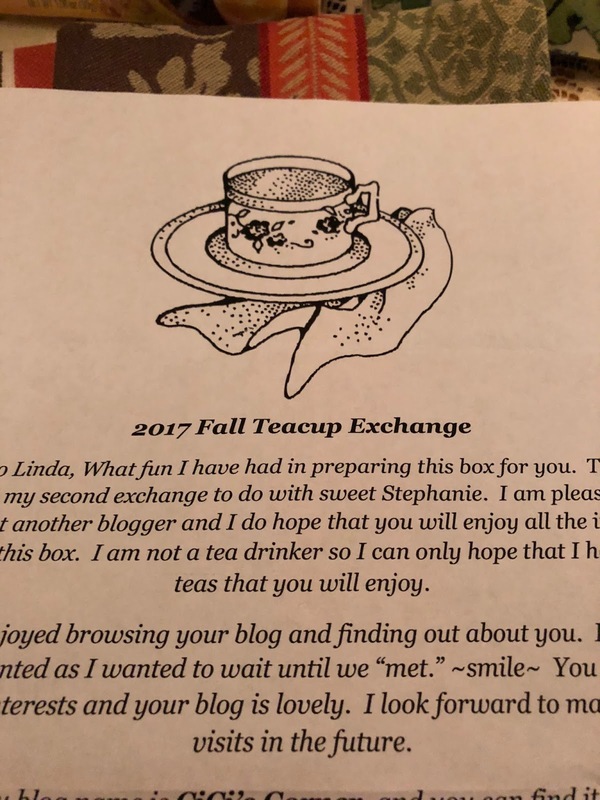 Lady Linda ♡: Sweet Stephanie's Tea Cup Exchange REVEAL! that is a really lovely cup and saucer and other special treats! How wonderful. I enjoy your posts and also the various ones in "Take Peace"! Oh Linda, your birdie teacup is beyond gorgeous. 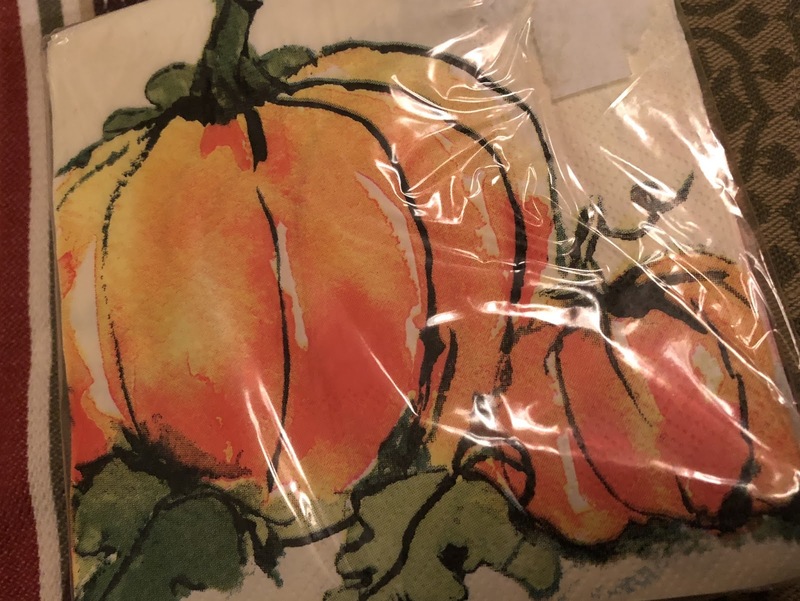 So glad you received such lovely treasures - sure is fun, indeed! Oh...dear Lady Linda! How I smiled as I read your lovely post...Lea blessed your with some beautiful tea time treasures! 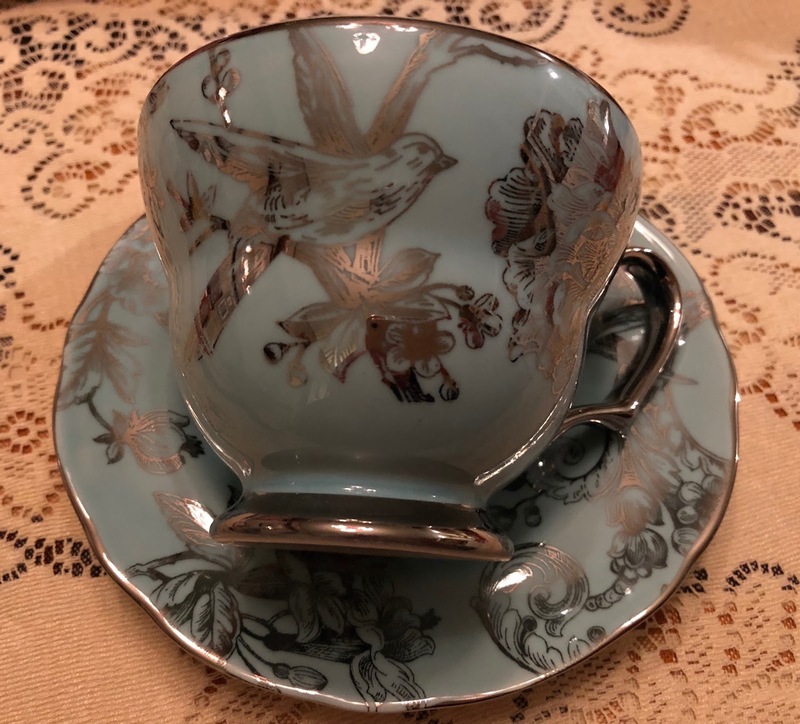 Your new bird tea cup is beyond gorgeous! Oh, I so enjoy this exchange! Love and more love to you! 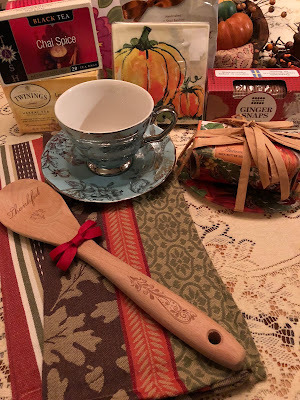 What a beautiful teacup you received from Lea, along with so many other treasures! Yes, she sure spoiled you, Linda. We are all so greatly blessed by our dear Stephanie's teacup ministry. Enjoy all your goodies! Awe, I'm thrilled beyond words that you enjoyed all your "happies." 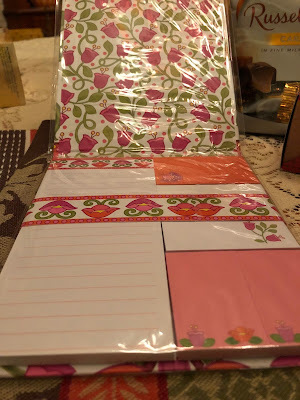 This is such fun and I have as much preparing my box to send as I do receiving my box. Wishing you the happiest of the upcoming holidays. Blessings abundant! 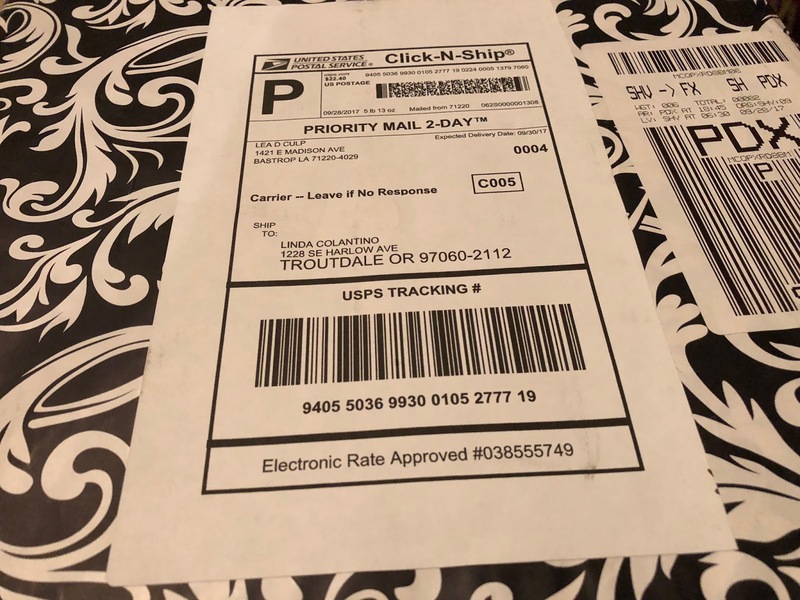 What a beautiful package you received from Lea! The tea cup is so pretty and unique. The color is lovely! 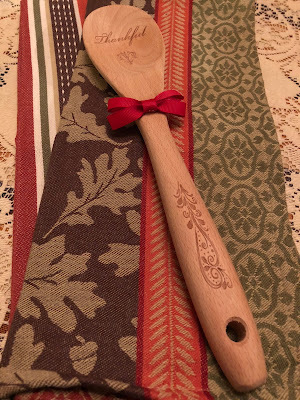 And all the goodies too....I especially love that wooden spoon! Enjoy all your new treasures! I'm already looking forward to the next swap! Stephanie is an angel, isn't she? Hello, my kind and lovely friend! 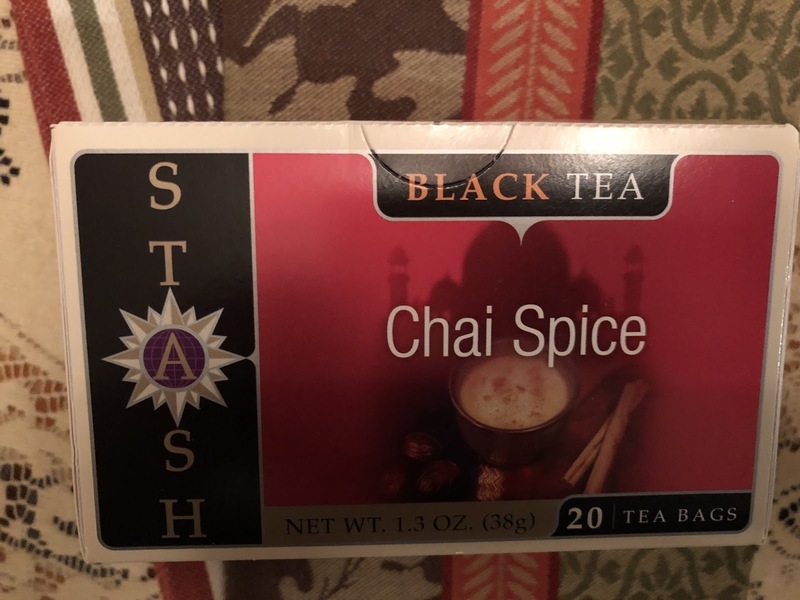 Well, if that isn't just the sweetest tea cup! It's quite stunning with its vibrant color and cute bird design. 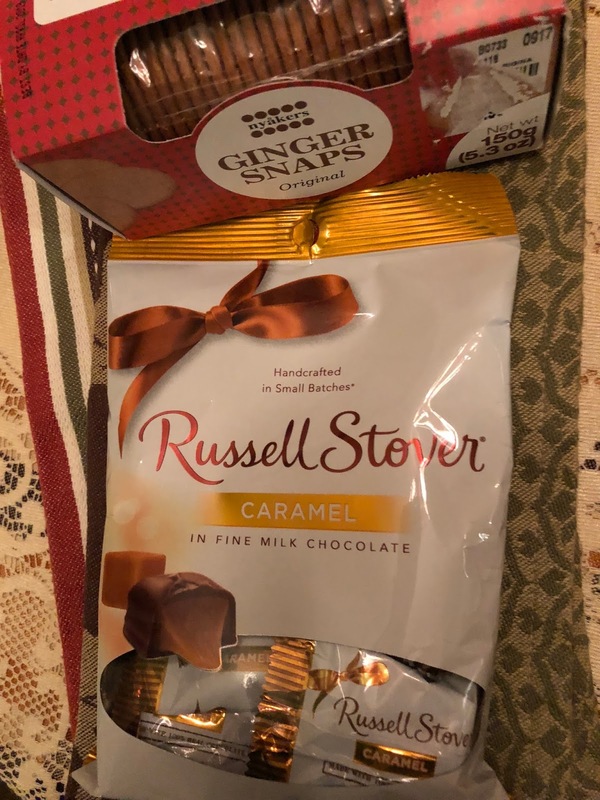 And oh, what wonderful treats Lea sent along with the tea cup. It was a joy seeing your gifts. Take care, dear Linda. Sending lots of love your way! 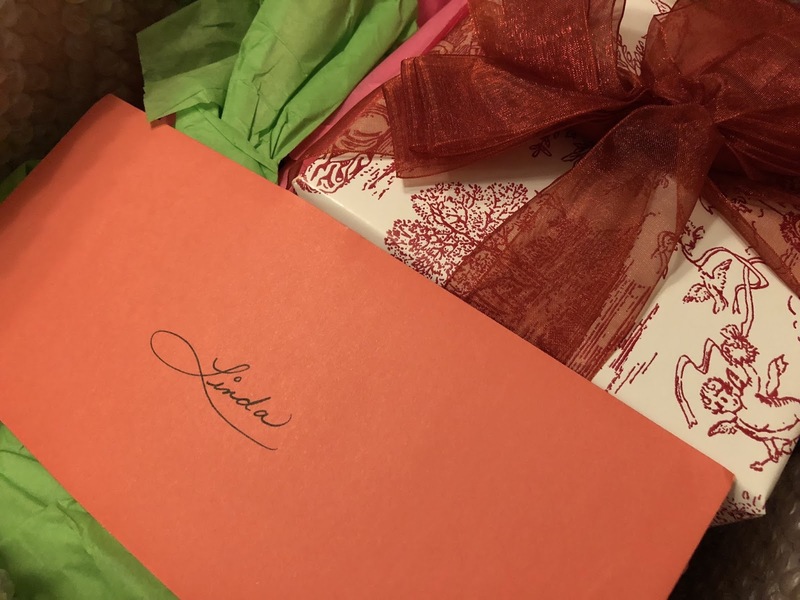 What a fun gift, Lea really spoiled you. 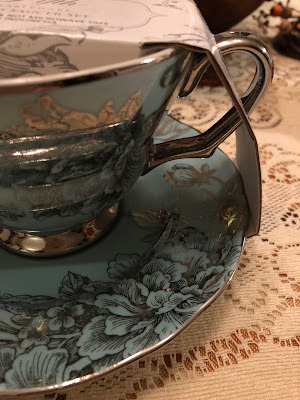 Super pretty teacup - love the color and the design. What a stunning teacup! The unique blue and silver design is perfect for winter decor. I also enjoy seeing new-to-me items as I bloghop during the reveal. Thank you for the visit, Linda. Hello Dear Linda ~ oh my my, that is a gorgeous tea cup! Lea did dich a lovely job gathering some beautiful items for your enjoyment. My mouth began to water when I saw those caramel chocolates, oh how I love caramel. 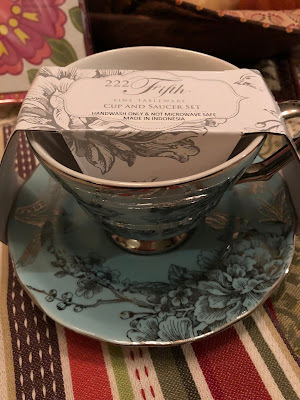 Your new tea cup is so unique and pretty! Hi Linda, what beautiful things you received. The tea cup is just gorgeous and I love the spoon. That bar of soap is just the cutest, I love how it's wrapped. 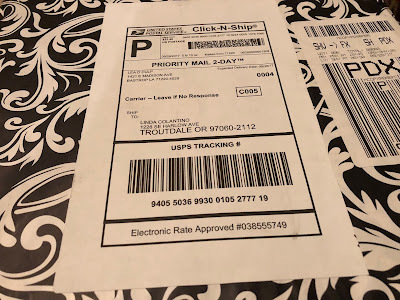 Everything you received from Lea is just wonderful. 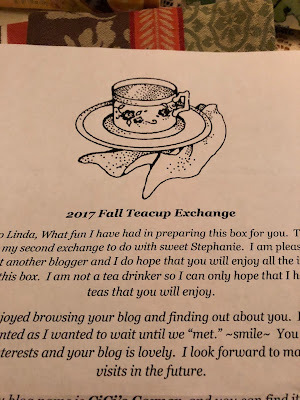 Isn't it fun to take part in Stephanie's teacup exchange? Lea really outdid herself. But I don't know you can stand to wait to open it. I start ripping into mine in the post office parking lot! 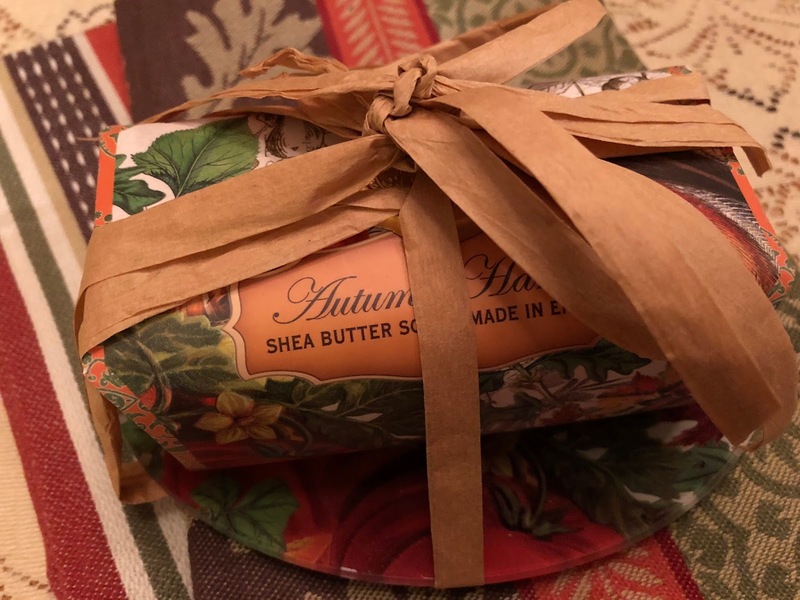 It's so much fun to see what everyone has given and received!I bet the autumn scented soap smells wonderful! That is a beautiful cup! I love the big ones - They hold more Tea! The blue and silver is just a perfect combination I think. Isn't this exchange fun? 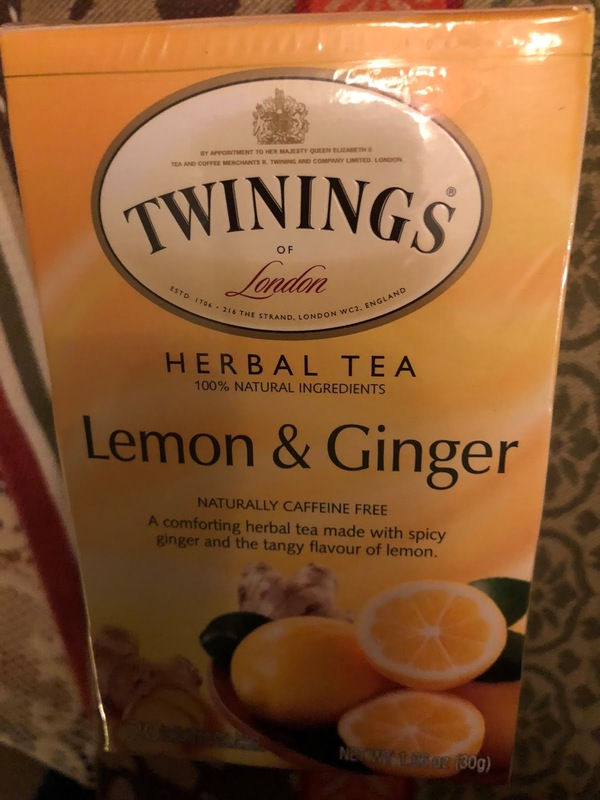 Oh my this is lovely! Turquoise is one of my favorite colors so I LOVE that cup and saucer. What I really like about it too is that the accent is SILVER which I also prefer. Most cups and saucers have GOLD trim. Looks like you were grandly spoiled with so many lovely things. 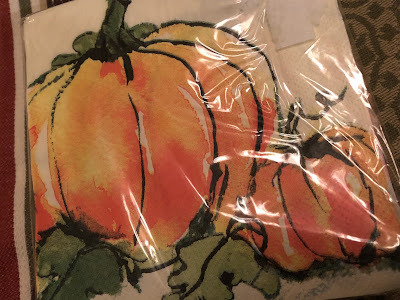 The swap is such fun and now I'm enjoying going around and visiting with everyone and peeking at the treasures that were exchanged. 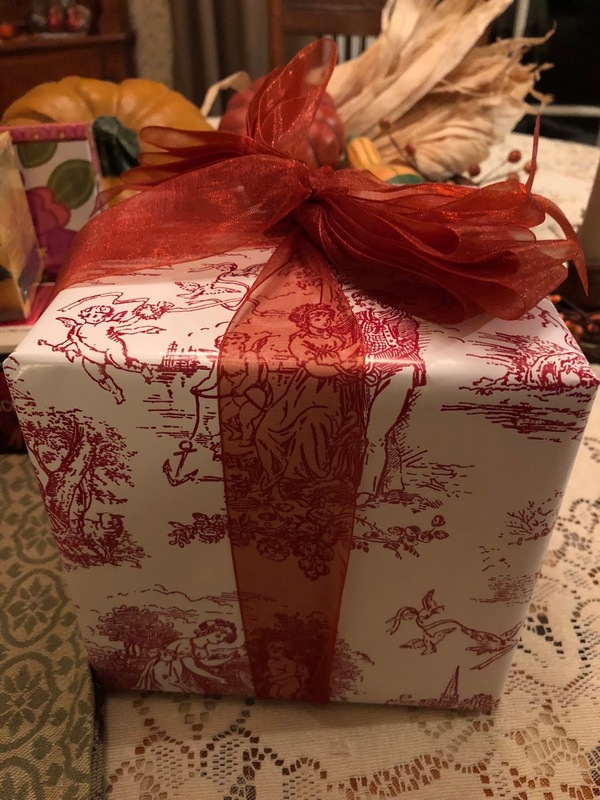 How wonderful to have such a great box with so many goodies! The swap sounds like such a fun thing to do!